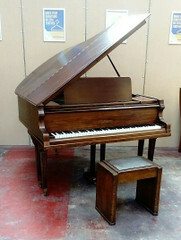 We are a hospice charity who have had a Baby Grand Piano donated to us. We are trying to sell it but potential buyers are asking us for more information which we don't have. Therefore we are looking for more information such as approximate age and where it was made. We understand that 'Hofmann' may have been used by many makers but we are hoping to find out a bit more. We have found the number 19306 stamped inside. The word 'Hofmann is inlaid in brass rather than printed. I'm sorry to say you have very little hope of learning anything from that name. I have a Hofmann upright, English Edwardian, but grands are usually difficult to date by appearance. The photos are such low resolution I can't see any useful detail. 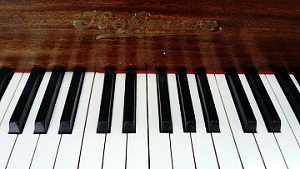 There were over 40 piano and music firms called Hofmann, Hoffmann, Haufmann etc.. Many piano names are meaningless, and people will just have to play it and see if they like it. More importantly, a tuner needs to check how well it holds in tune. Thank you for your quick reply. It is as we expected but we thought we'd try.